My birthday is just a few days away and I’ve been thinking about what kind of treat to make for myself. Then I saw this recipe in our daily newspaper, The Daily Inter Lake, and know it is the answer. Beets are my favorite vegetable! and dark chocolate is high on my favorites list, too. But because it includes sugar and brown sugar, I will need to make some adjustments. Also, I prefer to pre-soak my whole grain flour, so I include this as a variation of the original recipe. The presoak process mimics the early steps of germination, breaking down phytates to release the minerals for absorption, and reducing toxic lectins. Beets have amazing health benefits: they support the liver and detox processes; they help keep your blood pressure in the normal range (by providing nitrates that are converted to nitric oxide in your body; nitric oxide relaxes the walls of blood vessels to reduce blood pressure). I suspect the texture of this bread will be cake like – perfect for a birthday! I’ve adapted this recipe from one in an article by Kim Ode for the Star Tribune in Minneapolis; the author attributes the recipe to thelunacafe.com. I am avoiding sugar, so I’ve adapted the white and brown sugar ingredients to stevia and a bit of molasses to capture the right flavor. 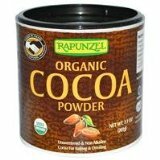 Also note that “cocoa powder” is not the same as hot-chocolate powder mix, as the latter is sweetened but pure cocoa powder is not. The original recipe suggests “high quality cocoa powder, such as Scharffenberger or Ghirardelli.” I use Rapunzel brand because it is Organic (and Rapunzel is also the brand for Rapadura minimally refined dried sugar cane juice cited in many of my recipes). The recipe calls for fresh rosemary (herb), but you could certainly leave it out. However, I think that herbs in general are not just for savory dishes, and that many herbs such as rosemary or thyme, are great in lightly-sweet treats. Plus they add health/nutrition benefits. 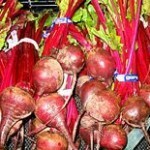 The original recipe doesn’t par-boil the beets, but rather uses then raw. After grating them, you squeeze out the beet juice, so that is not included in the recipe. 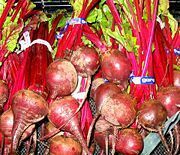 For either recipe (conventional method or pre-soak method), you may wish to par-boil the whole beets to partially cook them – but don’t cook too long or you will get enough juice you need to squeeze it out. While raw grated beet provides the most health benefits, its texture and chewiness remains in the final baked product. Par-boiling provides a smoother texture in the baked cake. To par-boil, don’t cook them until tender; rather just enough so that you can barely poke them with a toothpick, 15- 20 minutes. Then remove from the water and let them cool and dry a bit before grating. Note, however, that parboiling them produces more liquid when grated, so you will need to squeeze out the liquid. I recommend measuring the amount of liquid, then add that same measure of coconut or almond meal flour to the wheat/spelt flour to absorb the liquid. If you just toss the liquid, you lose a lot of the nutrients from the beets. In my opinion, they provide very little juice, so it is not worthwhile to juice them; you just have to add a bit of coconut or almond flour to soak up the juice. For the conventional method version using raw beet, just shred the beets and don’t squeeze out the juice – there’s only about ½ – 1 tsp of juice. If the batter is too thin, add coconut or almond flour, ½ tsp at a time until desired texture is achieved. For the presoak method version, you can do as for the conventional version, OR squeeze out the juice and add it to the buttermilk/soured milk to make ¼ cup plus 2 Tbsp liquid, as called for in the recipe. Then offset that added liquid with coconut flour, a pinch at a time until desired texture of the batter is achieved. For my first test, I will do the presoak option (second recipe). NOTE: I provide two options regarding the juice from the grated beet. When I tested this, I only got about 1 tsp of juice so added it back to the batter; if you choose not to squeeze out the juice, you will not need much coconut flour – 1 tsp or less – to absorb the juice. Prep: Place oven rack in the middle position and preheat oven to 350°F. Coat just the bottom of an 8½-inch loaf pan with butter, then add a spoonful of cocoa, shaking the pan to cover the bottom with a light film, then knocking out any excess. Peel then grate without squeezing out the juice (then add coconut flour to absorb the juice, after you add the sifted flour mix. OR, if you choose to squeeze out the juice, line a bowl with cheesecloth or muslin. Peel then grate beet onto the cheesecloth; squeeze the cheesecloth around the beet over the bowl, to squeeze-out most of the moisture into the bowl. * Transfer beet juice to a jar for another use, such as in a smoothie. Measure 1 ½ cups grated beet for the recipe and save the remainder for another use. Chop the fresh rosemary and add to the beet mixture. Bread: Into medium mixing bowl, sift together flour, cocoa powder, baking powder, baking soda and salt; set aside. If using stevia, dissolve it in the vanilla, then stir in molasses. Whisk in melted butter and eggs until smooth, about 2 minutes. If not using stevia, whisk together melted butter, white and brown sugars, and eggs until smooth, about 2 minutes. Stir in prepped grated beet and chopped rosemary mixture. Add the flour mixture to the butter-beet mix and combine gently but well using the spatula. No flour should be visible. If you retained the juice in the grated beet, add coconut flour, a pinch at a time to absorb excess moisture from the grated beet, until desired batter texture is reached. Bake: Scrape batter into the prepared pan, and bake in preheated oven for 40 – 45 minutes, until a toothpick inserted in the center comes out clean. ‘* Original recipe grates the beet over a double layer of paper toweling laid on a nonabsorbent surface such as a baking sheet; then gently fold and press the paper toweling to absorb any excess moisture. But this doesn’t allow the juice to be retained for another use. Conventional version not yet tested, but did test presoak version. I’ve adapted the original recipe to presoak the whole-grain flour; this is a bit difficult since the recipe does not include any liquid (other than the bit of liquid in eggs and beets). An acidic (sour) liquid such as buttermilk or soured milk is needed for the presoak; the next day, coconut or almond flour is added to absorb the liquid. On Valentine’s Day, 2/14/18, I tested this presoak version, and updated the recipe accordingly. Beet Juice: As result of the testing, I conclude it isn’t worth the effort to squeeze out the juice, since you get so little (about 1 tsp). I just use the shredded beet as it is. Acidic medium for presoak: You need roughly ⅔ the amount of whole grain flour. For this recipe, I recommend buttermilk or soured raw milk. But how much soured milk and coconut/almond flour to use to absorb the liquid in the soured milk? Rule: Amount of coconut flour (and of liquid added to the mix) should not exceed ¼ of the total flour (whole grain plus white). In the recipe, total flour is 1⅛ cup (⅞ cup whole wheat and ¼ cup white flour). Some math: While the recommended liquid for ⅞ cup whole wheat flour is ½ cup plus 4 tsp, the maximum added coconut flour (and also added liquid) should not exceed ¼ cup plus 1½ tsp each. the same amount (¼ cup plus up to 2 Tbsp) coconut/almond flour with the white flour the next day. While raw grated beet provides the most health benefits in this recipe, its texture remains in the final baked product. If you want a result that is more cake-like, I recommend parboiling the beet before grating, to soften its texture. Or you can cook it done and then puree it in your blender. (I do not intend to test the latter). For my first test of the recipe (See Testing, below), I used raw beets. For the second test I parboiled the beets about 30 minutes before shredding. For both tests, I saved the liquid produced from the shredding process, and added it to the pre-soak mix to retain nutrients in that liquid. The batter is much easier to combine thoroughly when the beets are par-boiled. See my pdf: Converting Quick Bread Recipe to Soaked Flour (cookies, muffins, etc.) – compressed for more detail. For soured milk, start with ¼ cup raw or pasteurized milk (not ultra-pasteurized) and add 1 tsp apple cider vinegar or freshly squeezed lemon juice, then let it rest about 10 minutes to thicken and sour. Instead of stevia and molasses, you can use 1 cup Rapadura; or ½ cup white cane sugar plus ½ cup dark-brown cane sugar, firmly packed. It may not sound like enough sugar, but remember, beets are sweet. NOTE: text in red has not yet been tested. Parboil beet until can barely poke it with a toothpick (don’t over-cook). Let it cool enough to handle, then remove peel and grate beet into bowl. Squeeze out the juice after grating – you get more from parboiled than from raw beets – to measure amount. Measure 1½ cups of grated beet, stir in rosemary (if using); transfer into a bowl to store, covered, in fridge overnight. If you squeezed out the liquid, add it to buttermilk/soured milk. Presoak: Mix melted butter with whole grain flour. Press waxed paper over the surface to keep it from drying out, then cover bowl with a towel to keep out light. Alternately, place bowl of batter in a plastic bag, then cover that with a towel. Next Day Prep: Place oven rack in the middle position and preheat oven to 350°F. Coat just the bottom of an 8 ½-inch loaf pan with butter, then add a spoonful of cocoa, shaking the pan to cover the bottom with a light film, then knocking out any excess. Chop the fresh rosemary and add to reserved grated beet. Bread: In a small bowl, sift together the white flour, 2 Tbsp coconut flour, cocoa powder, baking powder, baking soda and salt; set aside. If using stevia, dissolve it in the vanilla, then stir in molasses. Whisk in eggs until smooth, about 2 minutes. If not using stevia, whisk together vanilla, sugars and eggs until smooth, about 2 minutes. Stir grated beet/rosemary mix into pre-soak mix until well mixed. Gently fold in flour/cocoa mix. No flour should be visible. If needed, add more coconut flour, 1 tsp at a time, up to 8 tsp, to absorb any excess moisture until desired texture is reached. NOTE: I didn’t need more coconut flour for either test – see Testing, below. 2/13/18: Beet prep: Didn’t have enough grated beet – only ¼ cup beet plus 1 tsp juice – so covered and placed in fridge; purchased and grated more beet next day for total of 1½ cups, grated. Squeezed out juice (1 tsp total). Presoak: Made as written, Added ¼ cup soured milk (milk+ACV+yogurt) plus the small amount of beet juice to the flour/butter mix Batter has a good texture – not too thick or too thin. Pressed parchment over top and placed bowl in plastic bag and covered with a towel to rest on counter overnight. It’s cold here so may need to warm it on top of my pilot-warmed gas range in the morning. If need more moisture after mix in eggs, I can add as needed. Next day: Set bowl of presoak mixture on top of warm stove, to soften the butter. Meanwhile, grated more beet to have a bit more than 1½ cups total (did not squeeze out juice); added chopped rosemary to grated beet, then added combo to presoak mix. It’s pretty stiff so added another 2 Tbsp of milk (⅜ cup total, so far) and will let it soak a bit more on top of warm stove. NOTE: I forgot to weigh the 1½ cups of grated beet before squeezing out the juice, so I don’t know how many oz or grams of beet you need. Sifted ¼ cup unbleached white flour, 2 Tbsp coconut flour, ½ cup Cocoa powder, 1 tsp baking powder, ¼ tsp baking soda, ½ tsp unrefined sea salt. Combined ½ tsp stevia, 2 tsp vanilla and 2 Tbsp molasses in separate bowl; whisked in 2 eggs, then stirred into beet/presoak mixture. Interesting texture; I think I used too much beet (because it was hard to mix it with the presoak mixture), but we’ll see. It was a bit difficult to stir in the thick presoak mixture, and then the white flour/cocoa mixture, but I got it done, mostly. It did not need more coconut flour. Transferred to prepped pan (buttered bottom sprinkled with cocoa powder) – it’s more than ¾ full. Into preheated oven at 4:45 PM. Checked it after 40 minutes – not quite done, tho it has risen nicely. Out of oven at 5:30 PM, total 45 minutes. It smells wonderful! Result: It is delicious – nicely chocolatey! You don’t taste the beets, just the sweetness they provide. It is sweet for me (but I don’t like things really sweet); but probably not sweet enough for most people. Might want to increase molasses in the stevia version to 3 Tbsp; I would not increase the stevia. I don’t think it would need adjustment if you used all sugar. I did not use too much beet; however, my grater produced ¾” long pieces of beet. Shorter ones – about ¼” – would improve the overall texture. Alternately, par-boil the shreds before adding to the batter. Also, could have used more liquid in the presoak mix, to make it easier to stir in the beet on the next day; that change would require adding an equal amount of coconut flour. 12/22/18: Parboiled (about 30 min – too long), then grated two beets, but forgot (again) to weigh the first. This produced a little more liquid than could get from raw beets, so I placed them in a strainer, then pressed with my fist to squeeze out as much liquid as I could. Got scant 2 tsp juice and 1¼ cups beet. Added ¼ cup grated raw beet to get 1½ cups total. Saved juice to add to batter 12/23: mixed pre-soak ingredients: ⅞ cup whole wheat pastry flour, 1 stick of melted butter, ¼ cup milk soured with ACV), and reserved beet juice; pressed waxed paper over dough in bowl, then covered with a towel, and set to rest on counter at 12:30 PM. 12/24: Removed pre-soak from fridge to warm on top of pilot-lit stove; also removed beet mix to counter to warm. prepped baking pan with butter and cocoa. At 1:15 PM, stirred beet mixture into pre-soak mix; much easier with the parboiled beets. Combined cocoa and other dry ingredients (except stevia) in small bowl. In separate bowl, combined 2 Tbsp molasses with ½ tsp stevia and 2 tsp vanilla; whisked in 2 eggs, then stirred into beet/presoak mixture. Sifted cocoa mix over, and folded into dough. Nicely moist and don’t need more coconut flour. Scooping batter into prepped pan is a bit messy. OOPS! forgot salt, but it’s too late now. Into pre-heated 350°F oven at 2:15 on my grandfather clock; check at 2:55 but not quite done; removed at 3 PM total baking time 45 min. Result: Looks beautiful in the pan and can hardly wait to taste it. Mmmm, delicious and addictive! This entry was posted in Baked, Chocolate, Cocoa, Dairy, Eggs, Extract, Fat or oil, Flour, Grain, Herbs, Leavening, Root Veggie, Sweetener and tagged beet, butter, cocoa powder, eggs, molasses, rosemary, spelt, stevia, sugar, vanilla, wheat. Bookmark the permalink.